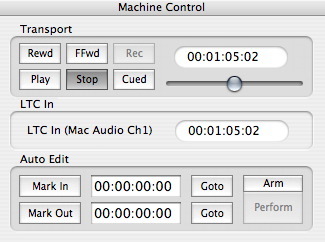 009 is Gallery's 9-pin Machine Control software which can be used as a standalone remote controller, but is often used as a Midi Machine Control)to 9-pin convertor to add 9-pin functionality to applications with MMC support. As well as adding 9-pin machine control to these applications, 009 reads LTC through the Mac's Sound Input jack and converts this to MTC to synchronise the applications. So, with 009 and 2 cables, you can slave your software to a 9-pin deck with no additional sync peripherals. On screen control of 9-pin (Sony P2) Compatible devices.